1. 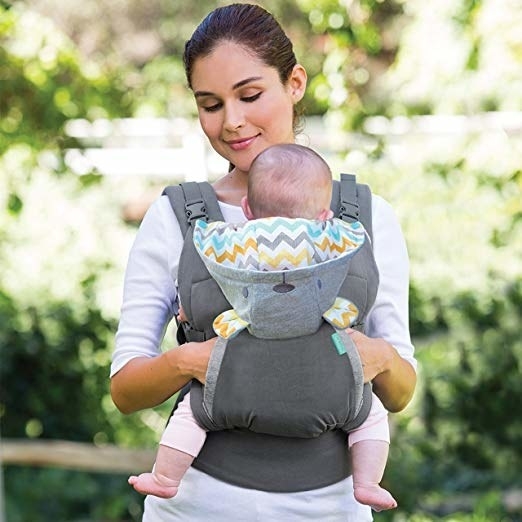 A six-position carrier with a 3D-mesh panel to regulate temperature, so both you and baby don't get overheated. 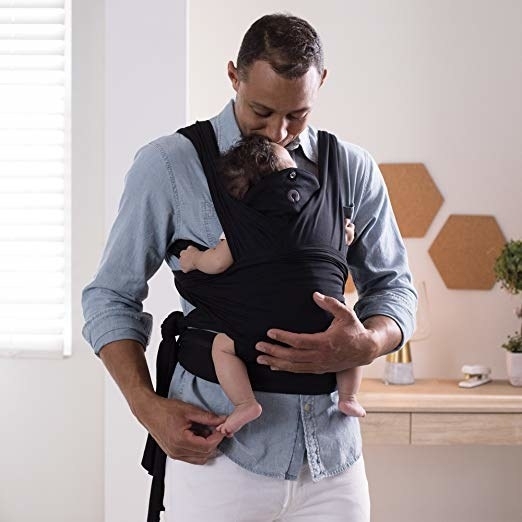 The baby carrier has six positions to hold your little one, including fetal, infant, outward, and toddler, hip carry, and back carry. It also has lumbar support, a zippered storage pocket, removable sleeping hood, and an extendable torso. 2. A wrap you can customize to work however you want it to, especially if you have multiple people of different sizes using it. 3. A four-in-one convertible carrier with a two-in-one bib to protect everything from baby's number one weapon: drool. The machine-washable carrier fits infants 8-32 pounds and can carry them in four different ways: baby facing in a narrow seat for newborns, facing the adult in a wide seat, facing outward for babies with head control, and on the back for older babies and toddlers. 4. Or a no-frills, no-fuss option with a bear-y cute hood that'll protect your little one from the elements when you're out and about. It holds babies 12 to 40 lbs, has a removable canopy hood, is machine-washable, and carries the babies both on the front and back. 5. A hip seat to help support your back if your child still wants to be carried long after they can walk. 6. A carrier you can use all year round, no matter what it's like outside, because it has an all-weather cover included to protect your precious darling. Plus, it can be used from birth without a newborn insert till your baby is a year old. It is also made from 100% cotton. 7. A 360 option that has a structured bucket seat to keep baby comfortable and happy — which will in turn make you comfortable and happy! 8. Or a carrier you'll get the best of both worlds with, as it has the seat and support of a structured one with the flexibility and customizability of a wrap. It's made of soft fabric with spandex and is recommended for babies 8-35 pounds. 9. A ring sling that'll probably make your phone start ringing off the hook because all your friends will be asking you where you got this amazing thing. It's made of eco-friendly bamboo and linen, plus 5% of sales are donated to families in need, so you can truly feel good about your purchase! 10. A sash wrap and tie perfect for more petite parents who don't want all the extra bulk. Plus, it has a detachable hood is and buckle-free and machine-washable. 11. A carrier made for the adventure-loving family that won't (and shouldn't!) let a baby stop them from getting out there and exploring the great outdoors. 12. Or a budget-friendly option if you're trying to be a more adventurous family, even if that means just making it to the park down the street. Plus, it has a removable large storage area to act as a backpack for all the gear you need. It's recommended for ages 6-8 months old. Promising review: "This thing is great. Our 5-month-old is just barely big enough to start using it, but we are excited for many hikes. This is as comfortable as you are going to get carry a baby on your back, and the extra pockets are great too. I highly recommended." —Scott S.
13. A wrap that slips on like a T-shirt, making it super easy to get baby in the right position as you're running out the door. 14. A carrier that holds a baby (or toddler!) up to 60 pounds comfortably without making you feel like you might topple over. 15. A fair-trade ring sling made of 100% hand-loomed cotton for eco-conscious parents who want to feel good about the products they're using with their child. 16. And finally, a doll carrier, if your older child wants to join in on the fun of carrying around something they love. When you've fed, changed, and held your baby and yet they still won't stop crying.